One of the biggest challenges facing parents today is how—and how much—to reduce the amount of time their children spend on electronic devices such as cell phones, tablets, video games, TV, and computers. It's an issue not just with older kids, many of whom are practically attached to a cell phone, but with younger children as well. The AAP also recommends that parents establish screen-free times (such as during dinner) and no-screen areas in the home (such as in bedrooms). And in a nod to the dangers of cyberbullying and online safety, the AAP also suggests that parents talk to kids about online safety and being respectful to others online. As we figure out how to have kids use screens in a practical, beneficial, and limited way, it's important for parents to keep in mind not only the benefits kids gain from limiting screen time such as increased sleep, improved grades, decreased aggression, and lower body mass index, but also what kids lose when screen time is not limited. Here are some important things kids miss out on when they're engaging with screens. Unless your child is using a tablet or computer to read a book or article, time on the screen is the time that could be spent reading. The best way to encourage kids to read and nurture a love of books is to read to them and with them, and setting an example by picking up some books you love and getting into them yourself. Make reading an integral part of your child's bedtime routine and be sure your child spends as much time with a book as she does with a screen. Remember the old saying, "Kids learn to read and then they read to learn." If your child is on a screen instead of in a book, that's a big learning loss. Time with family is one of the things that take a major hit when kids and parents allow the tech to take over their lives and everyone is staring at a screen instead of engaging with one another. (There's even a term for it—phubbing, or "phone snubbing"—which means checking email, texting, social networking, etc. on a cell phone instead of fully being with the person you are in a room with and should spend time with, like a child or a spouse). Designating times and places in your home that are screen-free—by banning tech devices from the family dinner table and talking to each other about your day and current events, for instance—is an important way to reconnect and really be with one another. 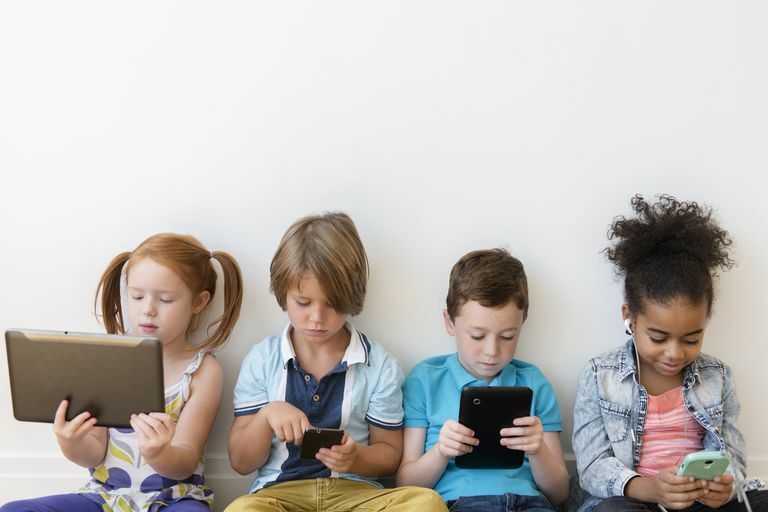 The way kids play and socialize today is very different from previous generations, thanks in large part to all the tech devices they are constantly connected to every day. When kids get together, they may play video games or Instagram or watch a favorite show on a tablet. Older school-age kids who have their own cell phones communicate mainly via text, and social media will play a large role in how they connect with each other. All this tech use means that free play, fully-engaged social interaction, and non-electronic games—like board games, outdoor games, or just tossing a ball around outside—will tend to take a back seat. Appreciating nature and getting the benefits of fresh air and exercise is something that's significantly compromised when kids are staring at a screen. Physical activity is important for kids' health, and even if your child's school has an excellent phys ed program—which is increasingly rare as more schools focus on academics at the expense of gym—it's beneficial for kids' mental, emotional, and physical health to go outside and run around and play. Using a screen often means passively being entertained or absorbing information. Even if kids are using tech devices for educational purposes (to read, to do research, or to play math games, for instance), they are still taking in information instead of thinking, creating, or imagining. While there are many benefits to having tech devices in our lives, such as having a world of information at our fingertips or being able to video chat with grandparents who may live hundreds of miles away, parents must be mindful of the things that are sacrificed if screen time isn't used carefully and limited. Kids can get a lot out of tech devices, but they need to thrive in the real world, too.